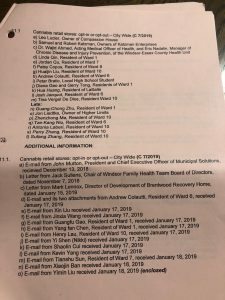 The council meeting was held last night in Windsor Ontario to decide to opt in or out of Retail Cannabis stores. It was refreshing to see the support of many of the councillors who had done their homework on the subject. The final tally was 8-3 for the City of Windsor to opt in. There was a great turnout from residents who asked to speak on the subject. Leo Lucier from Compassion House was the first delegate to speak. He confirmed that 81% of residents in Windsor supported the vote to opt in and also how important it is to choose responsible business owners to open Retail Cannabis stores. Leo responded to the questions about store locations which could include near daycares and addiction centres. “No responsible business person would open near a school, daycare or near a place like Brentwood” I spoke later in the evening and I repeated a conversation that I had with a young man who got addicted to opioids as a result of his high school football coach. He is now getting Cannabis treatment to wean himself off of opioids. Many of the delegates were Chinese and it was apparent from the first speaker that they were against it. I had to do a quick google search regarding China and Cannabis. Apparently Cannabis was used over 10,000 years ago and only banned in 1985. According to a Forbes article they produce 50% of the worlds supply Their arguments for opting out pertained more to stopping legalisation than the subject that was being discussed tonight. There were several medical patients in the audience who found it surprising that medical cannabis was not being discussed. Post legalisation, they suffered through delays of getting their medication and also shortages. There was a lot of fear mongering coming from the doctors who were delegates. Dr. Wajid Ahmed, is the Acting Medical Officer of Health. He has little to no experience on the subject of Cannabis. It would have been a better idea to have someone from the Cannabis Clinic there to talk about the patients that they treat and all the benefits. Everyone knows that Cannabis does not JUST include THC and CBD. Just another example of why more education is needed. One lawyer said it might have been the fastest way but not necessarily the best way to get Retail Cannabis stores in the province. Windsor was considered the Western Region and the winners were listed but did not include the city that they would be opening stores in. The complete list of municipalities and cities who have opted in or out of Retail Cannabis Stores.